Provides outstanding quality and value. It is economically priced and designed for small boats. Features: 360 GPH. 3/4" discharge outlet. Amp Draw: 2.5. Height: 31/2". Mayfair's First Mate is ideal for budget conscious boaters. Features: Low profile design. 400 GPH. Hose Size: 3/4". Amp Draw: 2. Height: 3 7/8". 18 month warranty. 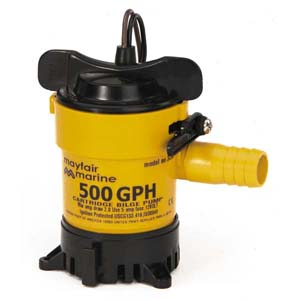 With a reputation for reliability in tough applications Mayfair's Pro- Line style bilge pumps are the choice of many for durability and dependability. Lower amp draw plus water cooling helps to prevent damaging heat build up. Quick release bracket to allow for cleaning debris. Hose Size: 3/4". 500 GPH. Amp Draw: 2. 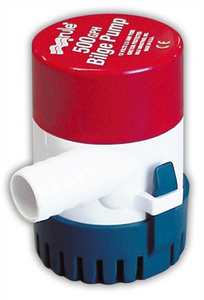 Size: 5" L x 3" W x 4" H.
Mayfair's cartridge technology delivers unrivaled power, convenience and reliability in compact bilge pumps. Dramatically improves the way boaters look at bilge pumps. The removable motor cartridge feature allows for easy cleaning and maintenance. Lift the tab, twist the motor cartridge and pull out. Hose Size: 3/4". 500 GPH. Amps Draw: 2. 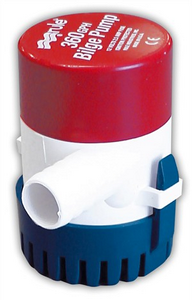 Size: 4" L x 2-3/4" W x 4-1/2" H.
The Rule 500 offers many design features while keeping size and cost to a minimum. 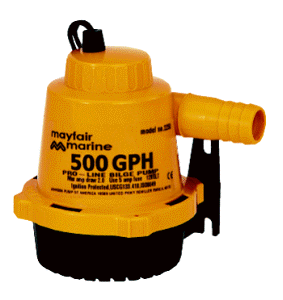 Especially popular on smaller craft, Rule 500 pumps are unmatched in pumping power and longevity. 3/4" discharge outlet. 500 GPH. Amp Draw: 2.5. Height: 3-1/2". 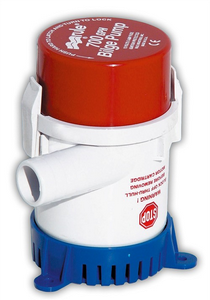 Features a removable motor cartridge that allows motor to be replaced while underway. Also, allows impeller area to be cleaned if clogs occur. 500 GPH with a 3/4" discharge outlet. 12-Volt DC. Rule's 700 G.P.H. 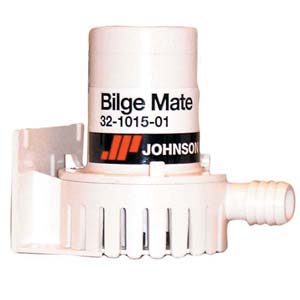 Pumps offer increased capacity in keeping with it's 3/4" discharge outlet. 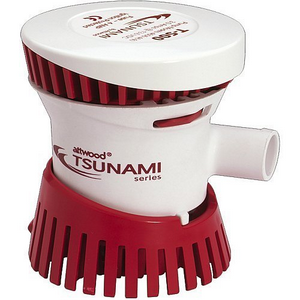 Features a removable motor cartridge that allows motor to be replaced while underway. Also, allows impeller area to be cleaned if clogs occur. 700 GPH with a 3/4" discharge outlet. 12-Volt DC. You are on page 1 of 4 available pages for your selected item.